Earlier this week, one of WWE's most popular tag teams came to an end. 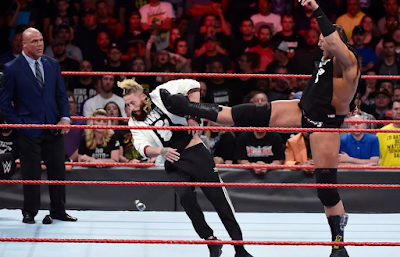 Big Cass put the big boot to Enzo and in an instant, the longtime partners were through. The action reminds me of when three of my favorite tag teams came to an end. Perhaps the most famous tag team breakup is the Rockers. In 1992 it was clear Shawn Michaels and Marty Jannetty were not feeling it anymore. A split had been teased for months, and finally, Shawn had enough and threw Marty through the window on the Barbershop segment. I enjoyed the Rockers as a tag team, but allowing Shawn to launch a singles career is one of the best moves WWE ever made. Adopting the HBK persona and attitude has put Shawn Michaels near the top of many fans' lists of favorites. The Mega Powers were destined to split up. The one time enemies became quick allies when "Macho Man" Randy Savage was being abused by The Honky Tonk Man and the Hart Foundation. Suddenly, with the urging of Elizabeth, Hulk Hogan made the save. The WWF's top two guys became fast friends and tag team partners. The relationship lasted roughly 18 months before the Mega Powers exploded. The buildup and breakup of these two will go down as one of the best angles devised by WWE. Davey Boy Smith and Dynamite Kid are still my favorite tag team of all time. The British Bulldogs teamed for a few years in WWF before heading back to the Stampede area. It was there that Kid turned his back on Davey Boy ending that duo. I never saw this play out on TV but read about it in the Apter mags as a teenager. In the long run, this too worked out well, at least for Davey Boy Smith. He would come back to the WWE a few times, winning the European, Intercontinental and Tag Team Championships. I love tag team wrestling. But I know there are times when it's necessary to split up teams and let the singles go on to bigger and better things. It's expected that Big Cass will be the big star of the most recently torn up tandem. Hopefully, Enzo finds success too, I really think he'd make a great manager/mouthpiece for someone.